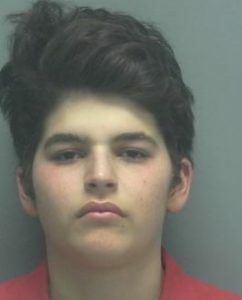 Two teenagers were arrested Wednesday for vehicular burglary on Hampton Park Court, according to the Lee County Sheriff’s Office. The robbery happened around 6:28 p.m. on the 13000 block of Hampton Park Court, deputies said. The victim searched for the suspects and later found a red 2002 Honda Accord as the suspects seemed to be leaving from another attempted burglary. Mugshot of Seth Logan via the Lee County Sheriff’s Office. When the victim approached the vehicle he recognized his stolen gym bag inside and removed the keys from the vehicle so the suspects were unable to drive off, deputies said. A nearby homeowner, Brad Davidson, was alerted by his barking dogs, exited his home with a firearm in hand and ordered the suspects to remain until deputies arrived, deputies said. The suspects complied and remained at the scene. Surveillance shows Seth Logan, 19, approaching a car, carrying a gun in his hand. “The motivation of those criminals, it gives me all the more reason to protecting myself with the second amendment,” Davidson said. Davidson says the neighborhood is planning on putting in more security measures, such as lights and security cameras. Logan faces charges of grand theft of a firearm, carrying a concealed weapon, armed burglary of a conveyance and grand theft, deputies said. A 17-year-old girl, who will remain unidentified due to her age, was also taken into custody and charged with armed burglary of a conveyance grand theft of a firearm and grand theft, deputies said.